One of these days I'm going to get with it and start posting more regularly, I promise! When parties and events are not my primary job, I tend to get easily overwhelmed and have trouble figuring out how to balance it all. The GOOD news is, conversations are happening and ideas are flowing...so when I come back to the blogging world you better watch out - cuz it's gonna be with a BANG! :) For now, my full-time gig (graphic design) and baking are taking up my time. Not a lot of baking, just a little bit here-and-there...trying out new techniques (some a win, some a learning experience :)) and playing with ingredient combinations...all that fun stuff! 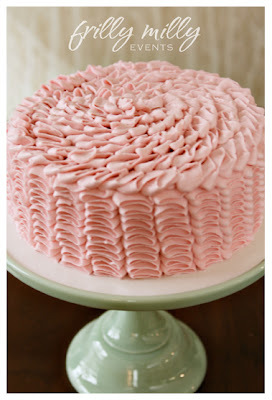 The cake pictured above was made using the "ruffle" technique. I honestly had so much fun making it - and am excited that I have a request to do another one before the end of the week! MEANWHILE, the big news is that I received an email from Amy Atlas' "Editor in Sweets" letting me know that she has chosen my farmhouse brunch as one of her "Links I Love" on the blog! 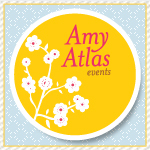 To be noticed by anyone, let alone Amy Atlas is such a huge honor. HUGE! And to Perpetually Engaged for the great feature (which the link will take you to) - thank you!! One of the most rewarding things about styling a party is getting to hear the feedback from other people - and everyone has been so incredibly kind! So THANK YOU to all of you who keep coming back. I promise that in a matter of time, you won't keep coming back to the same post day-after-day. Someday soon that will change!! Hey there! Thanks for sticking with me!! @Allie...I'm so glad I could offer inspiration! 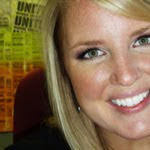 Let me know if there's anything I can help you with - I would LOVE to see pictures from your party! As for the ruffle cake - I have another one to make before the end of this week, so if I can figure out a way, I'll video tape it for you and post it on the blog when I'm finished! Check back in!